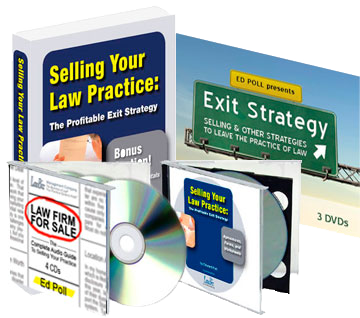 Everything you thought you knew about selling a law practice is obsolete. Ready for what's next? Noted law practice management expert Ed Poll brings together buyers and sellers of law practices through the newly expanded LawBiz® Registry. Whether you'd like to get paid for the goodwill of your practice through a sale or buy an existing practice rather than start from scratch, LawBiz® Registry is the first place to turn. Listen to this valuable interview where Bruce Dorner, a leading national voice to allow lawyers to sell their law practice talks with Ed Poll about LawBiz Registry, and how the registry offers an additional and much lower cost alternative to help lawyers monetize the value of their law practice. 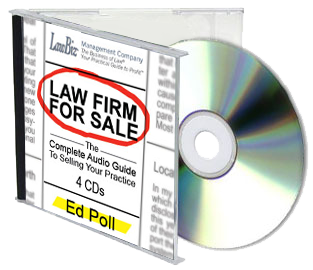 Ed and Bruce will also discuss rule 1.17 of American Bar Association Rules which allows lawyers to sell their practice. I enlisted Ed Poll about a year before I completed an all-cash sale of my estate planning law practice in Northern California in 2011. Ed made direct, personal contact with a number of local firms, and, at the same time, advertised nationally through his discreet listing service. Once we had solicited an offer from the best prospect., Ed negotiated contract formation in detail, and followed through to closing. Ed Poll is experienced, straightforward, upbeat and effective.